This image was a copy of a original image taken C.W. Woodward, Publisher of Rochester NY as part of his American Scenery, Portage NY series. Woodward's original title was also copied. This image was taken from the western bank of the gorge looking northeast. 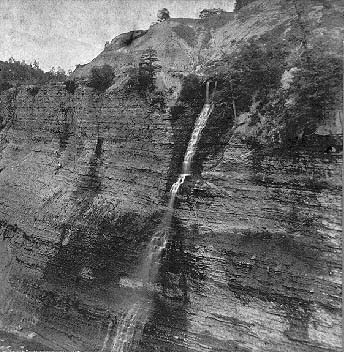 The ledge from which the water is falling to form the Bridal Veil Cascade holds the Genesee Valley Canal. The Fall was created as part of a waste weir system that would drain excess water from the Canal. Once the Canal was drained and abandoned, this popular waterfall disappeared. For another view of the Cascade, see Photo 68.